For the last 5 weeks, our members have upped-the-ante and are taking on our 10-Week Challenge. Each week, they get a new daily workout challenge – there are some really great prizes at stake, and a fun, “friendly,” competitive spirit between teams led by our BP instructors! I thought I’d share this week’s challenge with you because it’s great for squeezing in workouts when you feel like you don’t have much time! BP Teammates Jolie & Kelly show you in this quick video how to perform each exercise as well as a few modifications as options. Pick one of the 3 workouts below and rotate as you wish over the course of the week! Be sure to do some light stretching and cool down before/after your workout. Work hard for those 45 seconds! Quick transitions and keep up the intensity! 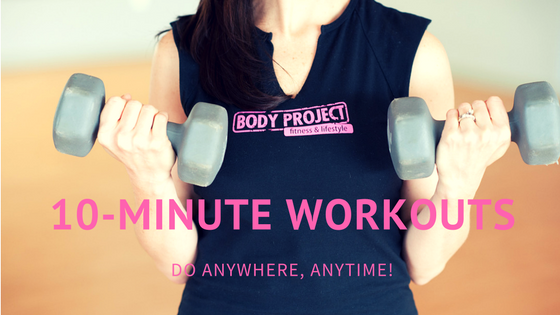 25 repetitions of everything, Repeat for 10 minutes!